There are several models to choose from depending on your needs. They all offer four or five stage filtration including a massive HEPA super-fine dust filter ! Austin Air Purifiers are all backed by a 5 year mechanical warranty and 5 year warranty on the filters too when in normal residential usage. There are 4 attractive colors to choose from and all have 4 sturdy casters. The Austin Air Purifier for pets is the choice for pet owners. It removes dust and dander as well as hair and odors. It has HEPA rated, four stage filtration for crystal clear air. An excellent air purifier when you love your pet but your allergies don't ! We recommend the Austin Air Healthmate HM400 Hepa Air Filter for clay dust for smaller studio potters, and also for any home usage. It covers 1500 square feet with normal ceilings. Use two or more units for larger areas. These filters are medical grade and clinically tested. They are HEPA rated (High Efficiency Particulate Arresting) which means that this machine filters 99.97% of particles down to 0.3 microns and 95% down to 0.1 microns ! It is highly effective at removing viruses and bacteria. With a layer of carbon and zeolite it also removes odors as well ! 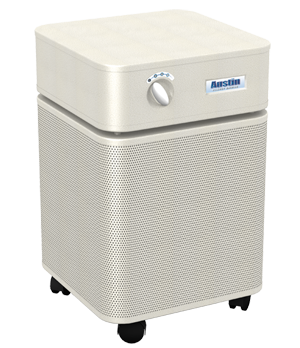 The Austin HM405 Allergy Machine Air Filter is the best choice for allergy and asthma sufferers. Chosen by the Red Cross and FEMA for addressing air quality concerns for post 9/11 NYC. Who should consider the Austin Air Pet Machine? The Pet Machine addresses the complete spectrum of air cleaning, removing sub-micron particles, noxious gases and chemicals. 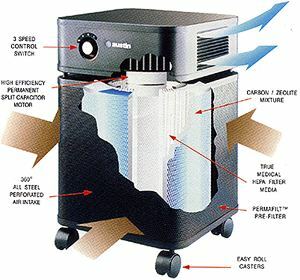 Austin Air’s 360-degree intake system draws air into all sides of the Allergy Machine, passing it through a 4-stage filter. Pets are one of the leading causes of allergies. 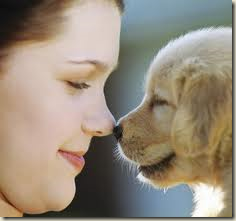 Our pets produce dander, saliva and urine which contain a protein. Dander is the flaking from the skin of your pet that sticks to the pet’s hair. As these pet byproducts dry, they become airborne and reduce the indoor air quality. They cause the allergic reactions which in turn triggers sneezing, watery eyes, hives and difficulty breathing. Diligently clean the rooms where your pets stay and operate a high quality air purifier to do a thorough air cleaning. Use The Pet Machine from Austin Air that has a HEPA filter and carbon mixture which removes airborne allergens and deliver fresh clean air. Many of us are sensitive to the protein that comes from our pets. Our hamsters, gerbils, cats and dogs produce protein rich saliva, urine and dander. As our pets move around and clean themselves, these elements spread throughout the home onto furniture, rugs, floors and bedspreads. They are also the source of pet odor that sometimes heavily permeates throughout the home. Pet byproducts are relative safe. However, if you are prone to asthma and allergies, your health can be affected. Like any allergen, your pets can trigger sneezing, difficulty breathing, eye watering and sometime more serious health concerns. Pet byproducts and odors can be removed by regularly cleaning the floor, rugs, furniture, drapes and bedding. Dust often with a hot damp rag. Vacuum your home with a High Efficiency Particulate Arresting (HEPA) filtering vacuum system. Steam clean your rugs, furniture and drapes with dry steam. Use an Air Pet Machine as your air purifier. This system comes with a High Efficiency Particulate Arresting (HEPA) filter effective at trapping the Â minute airborne dust, dander and the allergens caused by pets. Additionally, they contain an activated carbons/zeolite blend cloth which will reduce or eliminate lingering pet odors. The Austin Air Pet Machine Air Purifier will cleanse the air you breathe of cat allergens, bird feather dust, dog dander, germs, viruses & bacteria, asthma triggering irritants, most pet odors, as well as other chemicals & gases contaminates. We can live with our pets with little concern of allergy attacks by simply cleaning our homes and using the Austin Air Pet Machine Air Purifier.